A mockup of NVIDIA's 11 Series graphics card lineup. Not an official image. 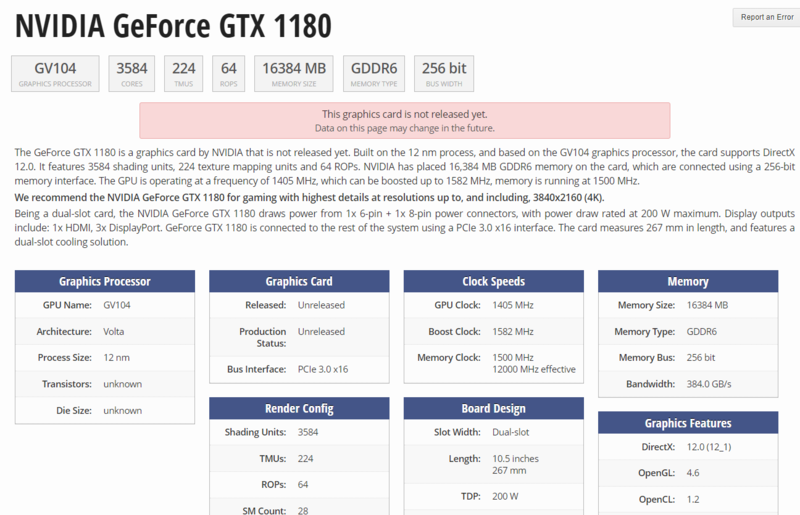 Looks like its leak galore today as the upcoming NVIDIA GeForce GTX 1180 next-generation graphics card was added to the venerable TechPowerUp GPU database. The data entered is very clearly of an engineering sample and we could see things such as the clock speeds improve further down the line but it does mean that the GPU is now entering the final stages before launch. The closest big event is Computex 2018 and all the rumors point to a launch around that time. The GPU entry lists the specifications for the graphics card – most of which are identical to the leaks we have seen before. The NVIDIA GTX 1180 graphics card will be manufactured on TSMC’s 12nm FinFET process which will introduce significant power efficiency upgrades on a core to core basis. The exact core count will be 3584 CUDA cores divided in 28 SMs. 64 ROPs and 224 TMUs make up the rest of the specifications. According to the same entry, the memory in question will be the GDDR6 variant with up to 16 GB worth of DRAM. A screenshot of the GPU database entry at TPU. The clock speed for the engineering sample was 12 GHz effective which is a step up from Pascal – keep in mind however that memory clocks can usually be clocked upwards quite easily. The GPU core clock is listed as 1405 MHz with the ‘base’ boost clock listed as 1582 MHz. If this is anything like Pascal, however, then this boost clock is just the minimum guaranteed rate and actual clock rates will be closer to the 1800 MHz mark then anything else. Pixel rate is 101.2 GPixel/s and Texture Rate is 354.4 GTexel/s. The peak floating point performance will be around 13 TeraFlops. As far as the physical specifications of the card go, the entry measured it at 10.5 inches in length and dual slot width. TDP is a cool 200 W that can be powered by a 1×6-pin and 1×8-pin configuration. This power setup can easily deliver more if necessary (for overclocking configurations). The card will have a single HDMI port and 3 DisplayPort ports. Here is where things get slightly murkier, however, the TPU GPU DB entry lists the card as a volta variant, which is odd considering the previous leaks have told us that the architecture in question will be called Turing. This might simply be a MachineID error where the GPU-Z tool is reading the architecture incorrectly. Turing is essentially a process shrink and optimization of the Volta architecture and will bring significant performance and power efficiencies to the next-generation graphics card. The expected launch date for the next generation of NVIDIA Turing graphics cards is probably around the Computex time frame. Earlier reports have indicated that they could hit the shelves as soon as July which means a tease or soft launch at Computex next month might not be entirely out of the question. As far as pricing goes, keep in mind that the crypto bubble has mostly burst (as far as graphics card pricing goes anyways) so we are expecting a slightly toned down MSRP of somewhere around $699-799 but that sticker will mean nothing if retailers and e-tailers decide to charge a heavy premium for them depending on demand.